If the away defeat to Old Scouts last October was Buzzard’s poorest performance of the season, Leighton saved their best rugby for the return match. Whilst all the tries were scored by backs, this victory was built on an excellent performance by the forwards who were dominant in the scrum and secure at the lineout. Leighton got the scoreboard moving after just two minutes as they burst into life from kick off. After a number of phases the ball was passed wide to the versatile Reece Harris-Smith who, unusually, was playing in the centre. Using considerable power, and despite the efforts of three defenders, Harris- Smith drove forward and stretched to ground the ball. The conversion was missed, but Buzzards led 5-0 after only two minutes. Leighton then doubled their lead after ten minutes with a well-worked move. 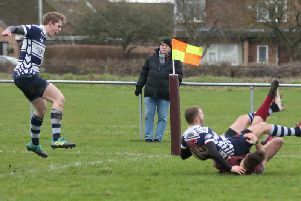 After the forwards had supplied excellent ball, fly-half Jack Whitehouse’s well judged chip was gathered by full-back Harri Sayer, who scored in the corner. It was 15 minutes before the visitors reached the Buzzard 22, but, on their first attack, and aided by some poor tackling, they scored under the posts. With the successful conversion, Buzzard only led 10-7, despite having had the majority of possession and territory. A James Brett penalty extended the lead to 13-7, midway through the half and shortly afterwards Buzzards scored their third try. Once again the initial pressure came from the forwards, with Dami Adebayo, Owen Forsythe and Jacob Murtagh all making in-roads before the ball was spread wide for Harri Sayer to score his second try. Again the difficult conversion was missedto make it 18-7. As with last week’s match, Buzzards put pressure on themselves by conceding penalties. Right at the end of the half, Old Scouts kicked a penalty into the corner. From the resulting lineout they drove over, to leave the half time score 18-12. Now playing against the wind, Buzzards were finding it difficult to break out of their 22 during the opening minutes of the second half. Pressure told and after six minutes Old Scouts broke through to score under the posts. The straightforward conversion left Leighton trailing 18-19. Buzzards’ reaction to this setback was almost immediate. Full back Harri Sayer broke from his own twenty-two metre area and was tackled just short of the line. The ball was quickly recycled for Jack Whitehouse to carve through to score Buzzards fourth try under the posts earning a bonus point. James Brett converted to give Leighton a 25-19 lead. The forwards were now increasingly influential, particularly with their dominance in the scrum and also with Dami Abebayo’s athleticism in the lineout. Following a number of attacking scrums there was a sense of inevitability when the forwards drove over for Leighton’s fifth try. Whilst definitely a forwards try, the ball was actually grounded by the opportunist centre Reece Harris-Smith to claim his second try . Shortly afterwards, and with about ten minutes left , Jack Whitehouse carved through for his second try to take the score to 35-19. There remained time for man of the match, Harri Sayer to once again look as if he was going to run the whole length of the pitch to score, but as before, he was tackled just short. Leighton remain in 12th place but are now eight points clear of thirteenth but seventeen points behind 11th place. They travel to Leicestershire side Oadby Wyggestonians in two weeks time.